Born into a non-musical family, Ms. Ngan Ha’s is the 6/9th grade of National Academy of Music’s pre-college program. By the age of 15, she has won numerous awards including the 2nd prize at 1st Chopin International Competition in Bangkok, 1st Prize at 18th Argento Concorso piano Competition, Italy (Cat.B), Absolutely 1st prize at 18 Valtidone International Music Competition for Young Talents, Italy (Cat.B), 3rd Prize Hanoi International Piano Competition (Cat.A), some First and Second prizes at 2nd Lansum music festival in USA, Third Prize (Junior Category, 14-16 years old) - 7th Maria Herrero International Piano Competition, Granada, Spain and many other prizes nationally and internationally recognized as well. She has also performed concerts and recitals at Hanoi Opera House, the Great music concert hall of Vietnam Academy of Music, and other famous halls in Vietnam as well as Italy, America for excellent music results. She performed as one of the solo performers with the Red Steinway and Son Model D-274 in the Steinway Red tour at Vietnam Academy of Music Hall in July 2015. Especially, she has performed Mozart concerto No.13 (Kv415) with Academy Orchestra last April 2016 and Chopin concerto No.2 in F minor, 1st Mov. with Vietnam National Symphony Orchestra and conductor Honna Tetsuji, last October 2017. After that, she’s got 1st Prize Concerto competition (Fall season) 2017, Category B – American Fine Art Competition (AFAF). She is working hard every day. She is practicing without any musical background or help from her family. Besides music, she enjoys academic school, where she is following Cambridge ICGSE program (Grade 10) with full scholarship. 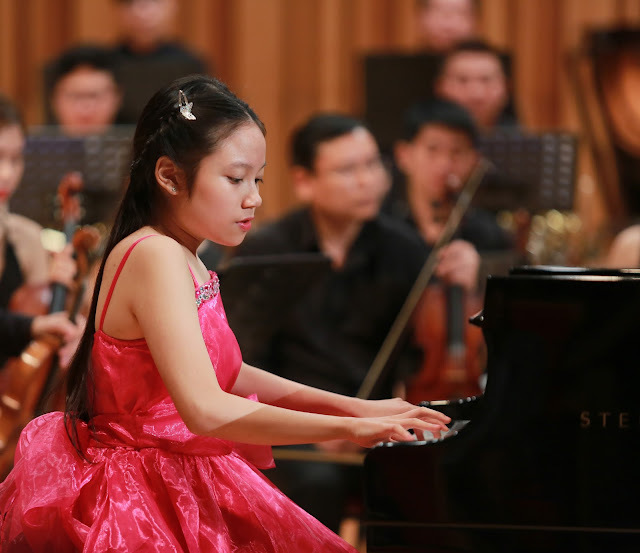 She was chosen as The Youngest person to receive one of ten “Hanoi capital city honor most outstanding young citizens of 2013” awards for excellent result in both academic school and music school. She also continuously received “Toyota Scholarship for Vietnamese Young Music Talents” in 2014 and 2015, Yamaha Scholarship 2016.